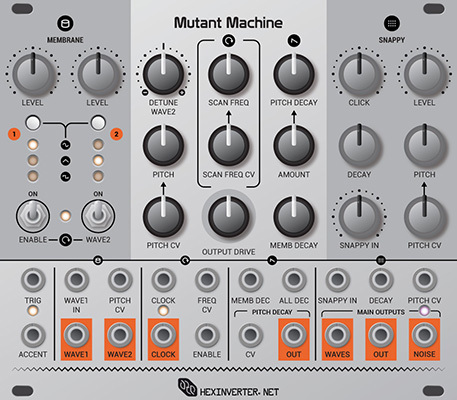 The Mutant Machine is a dynamic analog instrument capable of generating a wide palette of sounds, ranging from various forms of analog percussion to complex drones and oscillations. To achieve this, the Machine features two synthesis sections which are summed together at the final output: MEMBRANE and SNAPPY. 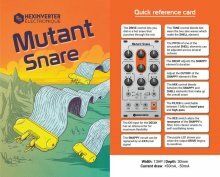 Like the other Mutant Drums, the MEMBRANE and SNAPPY circuits began their mutation as classic analog percussion techniques and have been reimagined for 21st century modular synthesis. 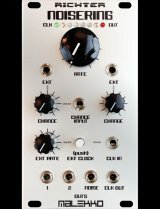 The MEMBRANE forms the main body of the sound by way of two analog VCOs, and the SNAPPY section further adds to the timbre by contributing noisy elements to the mix. A noisy CLICK which occurs at the beginning of the SNAPPY sound can have its volume adjusted independent of the main decaying SNAPPY texture. The waveforms which make up the MEMBRANE can be selected manually by button press, or the WAVESCANNER can be used to automatically scan through the available analog waveforms. 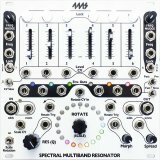 By modulating the frequency through which waves are scanned, unique, complex sounds are created. 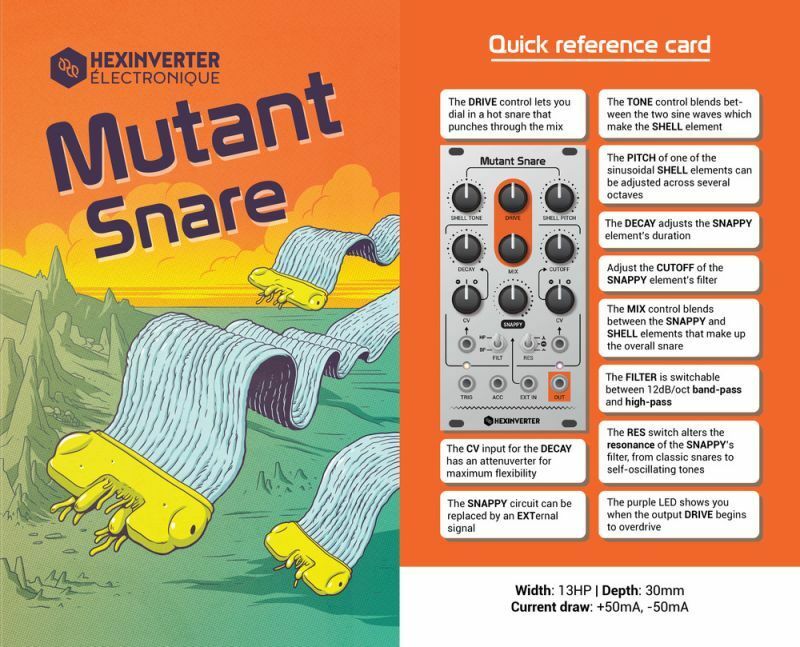 Experimentation is encouraged by the many modulation inputs and outputs available to you. 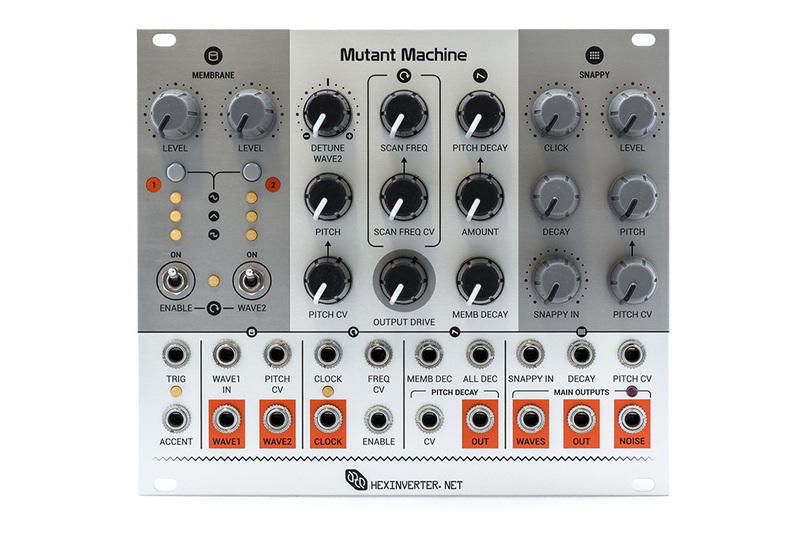 The Machine features 8 CV and gate inputs for modulation as well as two external audio inputs, for bringing other modules into the Machine’s core. 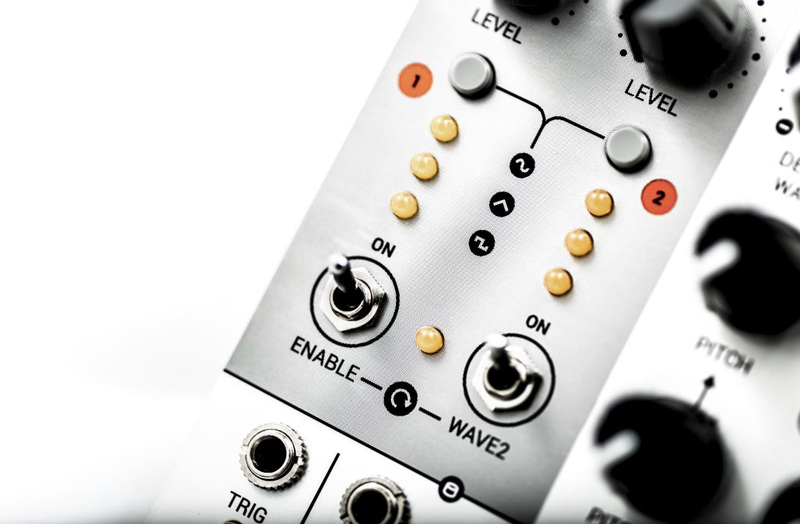 There are many audio outputs for maximum versatility, allowing you to use the Machine to create drones and alien timbres for use elsewhere in the modular analog system.